Access to the Health Care Center for all members of the South Florida community (not just Sinai Residences residents) is increasingly important, as projections show that 24% of Florida’s population could be age 65-plus by the year 2025. Additionally, at that time, seniors age 75+ will make up nine% of Florida’s total population, according to Claritas, Inc., which compiles U.S. Census data as well as newly available American Community Survey data. 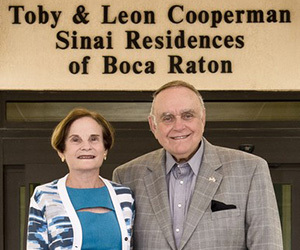 During the event, Toby & Leon Cooperman were also recognized for their $10 million gift to the Jewish Federation of South Palm Beach County. Sinai Residences was named in their honor a few months ago. 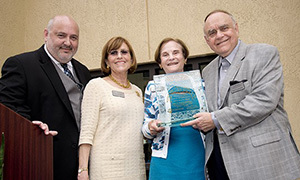 Matt Levin, President and CEO, Jewish Federation of South Palm Beach County, and Anne Jacobson, Chair of the Federation Board, spoke during the event, as did Chris Newport, Executive Director of Sinai Residences, and Jay Mikosch, Associate Executive Director. 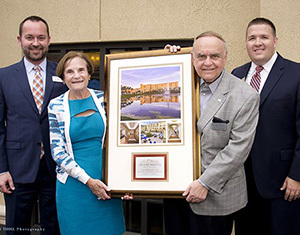 The Health Care Center is part of the $265 million, 650,000 square foot Sinai Residences Life Plan community, built on the Federation campus. Sinai Residences features more than 350 beautiful, state-of-the-art residences, providing support for all stages of senior life, including 234 independent luxury apartments, and an onsite continuum of care at the Health Care Center with 60 Skilled Nursing private suites, 48 Assisted Living apartments, and 24 Memory Care private suites. Sinai Residences guarantees independent living residents access to every level of care at a predictable monthly cost. Access to Health Care is also guaranteed to residents from the moment they move in, and for as long as they remain residents. Residents of the South Palm Beach County area are also welcome to take advantage of the Health Care Center’s services, which include rehabilitative services, physical, occupational and speech therapies. At Sinai’s Health Care Center, a highly skilled team of licensed therapists and nurses utilize state-of-the-art equipment and advanced research techniques to promote effective, quick healing and recovery following an illness, accident or surgery. Marvin Orenstein currently lives in independent living, but his wife resides in Memory Care, and has been there since the facility opened. “Before my wife moved to the Memory Care suites, I was taking care of her alone. I was shopping, cooking, cleaning and making sure she was comfortable. Now, she is taken care of, and I am free to enjoy life,” Orenstein said. Sinai Residences is a luxurious Continuing Care Retirement Community on the campus of the Jewish Federation of South Palm Beach County. 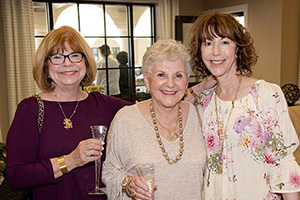 The community features independent living luxury apartments tailored toward active seniors, as well as suites for Assisted Living, Memory Care, Rehabilitative Therapy and Skilled Nursing Care. 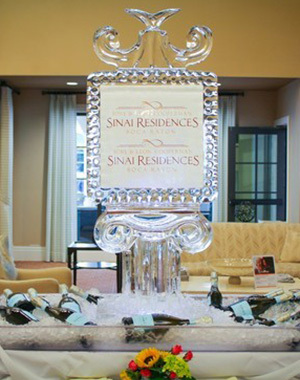 Sinai residents enjoy the highest standard of engaged senior living, with a wealth of luxury services and amenities that include gourmet dining with kosher options. Sinai Residences guarantees independent living residents access to every level of care at a predictable monthly cost. Access to health care is also guaranteed to residents from the moment they move in, and for as long as they remain residents. For more information, visit: sinairesidences.com.